It's late, and work demands my attention. I still went to class tonight, and I have been for the last few weeks. Which is good. Because if you keep going, eventually you stop sucking. Of course, once I decide to re-commit to this, I tweak some cartilage in my ribs the following night while training. Which is awesome. So now I have an upcoming belt exam, and I can't really train properly. A mentor of mine is telling me to take some time off (as is Klint, to be fair) and let it heal....but as anyone who has met me can tell rather quickly, patience is not my long suit. I've broken out the stim unit and I'm using that every few hours. Though I'm fairly uneducated with it and I have no real idea where to place the contacts so that it shocks the correct place in my ribs. Does that stop me? Of course not. Trial and error. We'll see whether I go to class tomorrow, and if I do, whether I do anything there or just sit there staring like some lost puppy wishing I could be on the mats. On a separate track: I have learned very quickly and effectively in the last few months how small and close-knit the American jiu jitsu community is. A training partner of mine told me he was moving down to Austin, TX, and asked if I knew anything about jiu jitsu academies down there. I, of course, do not, but the ever-knowledgable (and fellow legal professional) Georgette Oden knows all about Texan jiu jitsu, so I sent Kyle her way. A week or so later, Georgette messages me to tell me she met Kyle at class and was more than happy to help him find a new home academy. Then Bear Quitugua, Shoyoroll's president/founder/CEO/etc added me to a Jiu-Jitsu/Craft-Beer Crew group on facebook, which also has a handful of other Guerrilla Jiu Jitsu students on it. I may or may not be the only midwestern representative, but I'm sure that won't last. So I'm apparently out of training for at least tomorrow, and possibly a bit longer. I won't be able to train properly (i.e., full resistance) for quite some time, I'm sure. But I'll be drilling and working back to it slowly. I hate injuries. I'll note at the beginning---as I'm sure I have in the last several posts on this space---that I have been absent for too long. Absent from blogging, that is. I've maintained a consistent training schedule throughout, but with my job, my wife, our son, said training, and the rest of the obligations that come along with those priorities, some things had to give. Among those things was this chronicle. I will work to keep gaps like those that have plagued this space for the last year to a minimum. I have several reasons for that, both professional and community-oriented. Suffice it to say, this gives me an opportunity to do more than simply remember jiu jitsu allows me to combine important goals. As I said above, I've been fortunate to maintain a consistent training schedule. I get to train and roll no less than three times a week. And usually no more than four. I would like more, my wife and son would appreciate less, and so this is that middle part of the venn diagram. So this is how much training fits in my life right now. This seems as good a time as any to revisit my stated goals of 2013. 2) Compete at least once, hopefully twice. [Check] I competed at the IBJJF Chicago Summer Open in August and completely shat the bed. I went in hoping to work a little bit on my feet rather than jump to a guard position that I would feel comfortable in. I kept telling myself that it wasn't about whether I won, but about how to show that my jiu jitsu is improving and my comfort level in challenging areas that I normally avoid---like takedowns. So the match started, I grip fought for roughly 9.2 seconds, then grabbed his lapel and sat to open guard. Exactly as planned. Really, what happened after that didn't matter. I didn't have the discipline to do what I said I was going to do. All the same, my opponent ended up choking me in around 2 minutes. So really, bang on job there. It doesn't matter how many times you tell yourself that it's like a hard day training at the academy, competing is different. And I maintain that I don't particularly like it. I still pile on the pressure whether it's needed or not. Not only is it unnecessary, it's unfair to myself. I don't have time to train six times a week, and I don't have the training partners and resources that a lot of other guys have. That being said (and it sounds like sour grapes even as I type it), I am confident that I could beat that guy in an academy. Still, his hand got raised, and I went quickly to find good beer. 3) Train outside of Minnesota. [Check] At Christmas, I trained at a Carlson Gracie academy in Aurora, IL. Twice. It wasn't a ton of training, and I didn't get to train with a lot of guys who could beat me down, but it was training away from home, which demands a different kind of etiquette and awareness. Because no matter how technical you're being, it doesn't do any good to rough up someone while you're visiting their academy. You're outnumbered, and you're at a place where they train how to hurt people. Best to release a triangle when they put their knee on your jaw rather than to squeeze until they're unconscious and then pose like Ali. Just sayin'. 4) Work my weak positions. [Check] I've been focusing on my passing for the last four months straight. I'm not a nice passer, nor am I good at it. But I'm better than I was and I'm more comfortable on top. 5) Work the Belt. 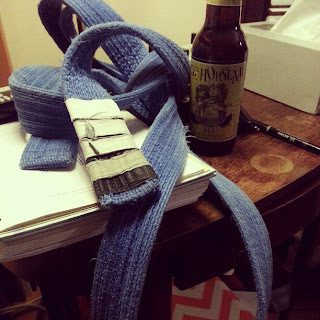 [God I Hope Check] I have three stripes on my blue right now, and I'm testing for my fourth stripe sometime next month. I am asked surprisingly often when I think I'll get my purple belt, and I always give the same answer: When my instructor thinks that I've earned it. Also this past year, I've begun two friends on their own jiu jitsu journey, which is wonderfully fulfilling. I've gotten to train with both of them a few times; one lives in Ohio and another trains at another academy in town, so unfortunately we're not training partners. They seem to have gotten the bug, and that pleases me. A lot has gone on in the jiu jitsu community in the last year, let alone in the last month. I'm not sure exactly what kind of position I want this blog to occupy in that discussion. I've noticed that since I started this blog, my posting frequency has somewhat mirrored my internal approach to jiu jitsu----when I needed to focus more on my own individual goals and improvements without looking for external approval or approbation, posting declined. When it was time to focus on the community, my training partners, and look for ideas from the outside, posting increased. I don't know if that's something that other writers have noticed, but I found it interesting enough to merit a mention. I suppose that soon I'll have a new list of goals for the year, and possibly some personal takes on issues in jiu jitsu as a whole. I'll admit, though, your guess is as good as mine as to what those will look like. Right. That's all for now. Yeah I got my third stripe on my blue belt this past weekend. At least I think it was this past weekend. It was a Saturday. And I followed it up with an Oktoberfest. So it had to be this past weekend. The academy is still small, but it allows us semi-privates for every class, so I'm not complaining. I got my wife's cousin into jiu jitsu, but he's out in Ohio, so I don't really get to reap the training benefits of that one too often. Though it did give us an out to go train at a place in Denver during a family reunion. That was slick. I also got another friend to start training. He has one stripe on his white right now, so that will begin paying off soon. Hopefully by the time he gets his blue, I'll have something resembling a top game.